Increasing the life of a transformer - How important is cooling? 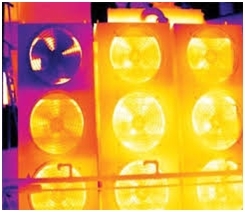 Increasing the life of a transformer – How important is cooling? If you’ve been following this blog for a long time, you know that we dealt with transformers a lot. This topic is interesting and much requested so we did our possible to add more publications about it. Copper loss or I2R is the main reason for the heat generated in an electrical power transformer. Though there are other losses such as hysteresis and eddy current losses which are also responsible for the heat generation, I2R is considered as the main factor. If the heat thus generated is not cooled or dissipated properly, the paper or the liquid insulation present in the transformer may get damaged, forcing the transformer to fail permanently. In order to avoid this, a proper cooling system has to be installed in the transformer. Cooling system plays a vital role in increasing the life of the transformer. As we all know, many end users overload the transformers beyond their load tolerance capacities during peak usage periods. This in turn generates heat above permissible levels in the windings of the transformer. As a result, the ageing of transformer’s insulation gets accelerated, decreasing the life of the transformer. Hence, a proper cooling system, which is capable of dissipating the excess heat produced in the transformer, is very important. Such cooling system, will keep the heat generated in the transformer under permissible limits, and plays a major role in increasing the life of a transformer. There are various types of cooling methods employed in an attempt to increase the life of a transformer. Let us now have a look at them. In order to increase the rate of heat dissipation in an electrical transformer, various external cooling methods are in use. Each of these methods is employed depending on the rating and the size of the transformer. ONAN, “Oil Natural Air Natural,” is the easiest method of cooling transformers. 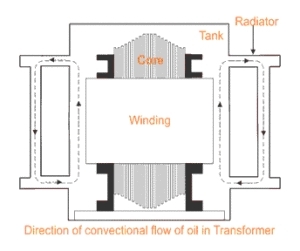 In this method, the oil that gets hot because of absorbing heat from the windings of the transformer flows into the upper tank of the transformer, naturally, due to convection. And the cold oil takes its place. The hot oil that moves into the upper tank of the transformer is again cooled, naturally, by exchanging heat through conduction, radiation and convection methods into the air. When the oil in the tank gets cold, it naturally flows back into the radiators of the transformer. This circulation of hot and cold oil takes place as long as there is load on the transformer. Since the dissipation rate of the heat depends on the surface area of the tank, this kind of transformers tend to have large circulation tanks. Also, additional surface area for quick dissipation of heat is added in the form of tubes and radiators to the tank, so that the transformer gets cooled quickly. ONAF, “Oil Natural Air Forced,” is a method employed to make the dissipation of the heat from the surface of the radiators, even faster. In ONAN method, heat from the hot oil is dissipated through the surface of the tank, naturally, into the air. In this method, forced air is used to accelerate the cooling process with the help of fans. Fans blowing air on the cooling surface can dissipate the heat faster when compared to the air absorbing the heat from the hot surface, naturally. This method allows you to apply more load on the transformer, without crossing the permissible heat levels in the transformer, as the fans employed in this type of cooling system, help cool the transformer windings quicker. As a result, both the performance and the life of the transformer are enhanced. 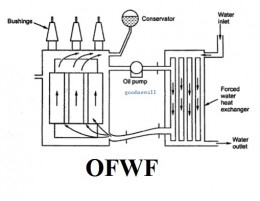 OFAF, “Oil Forced Air Forced,” is a method employed to cool transformers much faster than in ONAF method. In ONAF method, only air is forced on to the hot surface to cool it, but the circulation of oil in the radiators, still follows natural convection method, which is very slow. 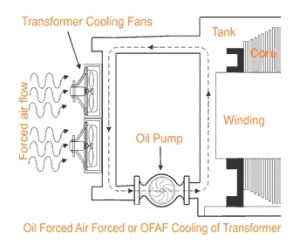 But in OFAF method, even oil is forced to displace quicker, allowing the transformer to cool much faster. In this type of cooling system, pumps are employed to pump up the oil, forcing the oil circulation to be quicker when compared to natural convection. As a result, rate of the circulation of the oil in the radiators increases, increasing the rate of dissipation of the heat from the transformers. OFWF, “Oil Forced Water Forced,” is a much more sophisticated method compared to the methods discussed above. In this method, water is used as the medium for heat transfer rather than air. As we all know, under any given weather conditions, the temperature of water are less than that of air. This is the primary logic used in this type of cooling system. Here, the oil circulated through the radiators of the transformer goes through a water chamber, where jets of cooling water are showered on to the pipes containing the hot oil. In this process, heat is exchanged much faster and the oil gets cooled much quicker making the cooling system much more effective. This type of cooling system makes the design of the transformer more compact and is capable of increasing the life of the transformer tremendously, if employed and maintained properly. Whatever might be the method one might use to cool the transformer, one should always bear in mind that fans, pumps, valves, heat exchangers and other components of the cooling system are regularly checked and maintained properly to ensure the long life of the transformer. Even if one fan fails, or if the pump has a leak, it will affect the other components of the cooling system increasing the temperature in the transformer invariably, failing the insulation and sometimes, the entire transformer itself. Maybe you have other tips to share? Feel free to give your impressions in the comments section below! 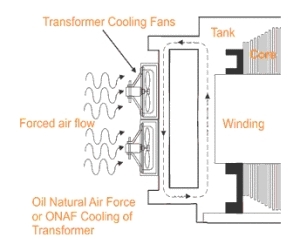 or copy this trackback: http://engineering.electrical-equipment.org/power-quality/increasing-the-life-of-a-transformer-cooling.html/trackback from your own site. LV and MV Switchgears – How to inspect, test and measure?